Most holiday goers enjoy scuba diving and snorkeling, as we all do. However, there are a few issues that had for quite a while prevented such people from having the best experience. 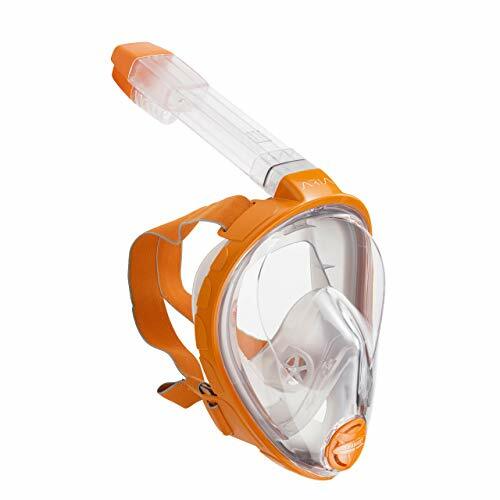 Full face Snorkel masks have played a significant role in doing away with most of the problems. Thanks to them, vacation goers can breathe with their nose now and not get the foggy view due to my breath condensing on the mask’s face. This also rules out any spitting in your mask during snorkeling. The Ocean Reef Aria Snorkel Mask addresses all those issues. It is the perfect example of a full face snorkel mask that has come a long way in providing the best experience when snorkeling. The full face snorkel masks may have been around since 2014, but quite some snorkelers are not familiar with them. They have enriched the snorkeling experience by doing away with jaw fatigue caused by biting the mouthpiece that comes with the more traditional masks and is very comfortable hence we can now take longer dives. There is a growing market for them, and a lot of brands are entering with a wide range of quality and price. You should, however, not buy a full face snorkel mask if you intend to use it in taking swimming laps or if you like to dive down a lot. It will be a disappointment since they are not designed for that. The primary purpose is to keep water from reaching your face. Without trying the mask, it is essential to check the sizing of the manufacturer to make sure that it won’t leak. The best other alternative is to check out other buyer reviews and how the manufacturer responds to queries on its functionality. A snorkel mask with double seals stands a better chance at keeping water out. Where and how you intend to use the snorkeling mask are essential factors to consider. There are more expensive snorkel masks that will keep water out in deep waters if you want to use it in deep sea diving. The purpose of the mask will quickly narrow down to the type of mask you want. If you prefer to dive a lot during your snorkeling excursions, then a traditional mask might be a better choice for you. They provide less uplift as they don’t trap that much air inside the mask and make it possible to dive down. An excellent snorkeling mask is adjustable to different shapes and sizes. This is to conform to individuals’ faces without leaking. The straps have to be easily adjustable preferably with one hand. Part of this also has to be that you can quickly take the mask off if you need to. There is quite a variety of lenses that are fitted in snorkel masks with each differing in price. If you do real deep dives, then you might want to consider using glass lens masks that do not fog at all. The glass lenses also do not get as easily scrubbed as the plastic lenses. An excellent and efficient way to control fog that forms on the face of the mask is to have a good flow of air in the mask. Many masks have the breathing chamber separate from the lens so the breath won’t fog up the lens. Having a lot of airflow and circulation also allows breathing more naturally which makes snorkeling more enjoyable. Air circulation is not only limited to the air inside the mask and how much air you can breathe. When breathing out, it’s vital that the CO2 enriched air is quickly transported out of the breathing chamber. When you’re planning to purchase an expensive mask, a solid product warranty is a necessary consideration. In most cases, it will allow you to know that the brand you’re considering stands behind their products. Depending on your needs it can be of importance that specific accessories are available. These can range from action camera mounts to special lenses if you need prescription glasses. Ocean Reef has made full face snorkel masks for a long time and has gained much traction in the industry. These goggles are a good testimony of their quality. When you put on the mask, the first thing you will notice is its soft and comfortable feel on the face with smooth edges and a well-designed structure. The product also promises to offer a great view of the underwater world. This is through its flat lens, which does not distort the picture as the spherical lens would. Among the many more features this premium product offers its customers, the most important is the panoramic view provided by the wide lens. The mask covers your whole face so that you have a 180-degree view in each direction. 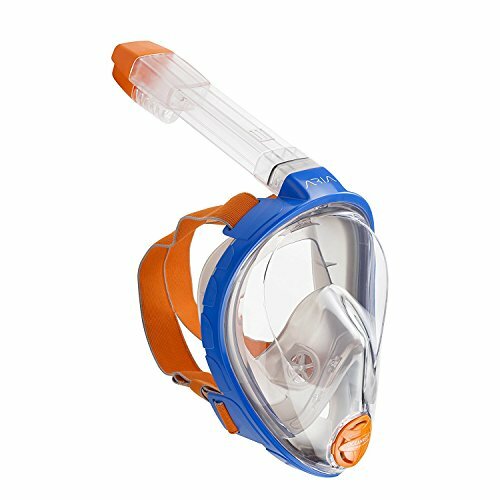 Since the large lens could be prone to breaking, the Ocean Reef Aria snorkel mask has its lens made out of shatterproof polycarbonate. The Ocean Reef Aria snorkeling mask is especially useful if you have a problem with your vision and would like to enjoy the same view as everyone else. This is achieved by supporting the Optical Lens Support accessory compatible with Aria sizes L/XL and S/M. This product is, however, not recommended for duck diving and swim laps. The Ocean Reef Aria snorkeling mask is designed for leisurely snorkeling at the surface of calm water. Though you can dive up to three meters below the water surface with a full face snorkel mask, they are not meant for free diving either. Full and un-distorted 180 degrees view. The mask doesn’t fog up, and there is no need to spit into the mask. It has a dry top that ensures no water enters the mask when snorkeling. One of the most useful features of a full face snorkeling mask is the broad and more unobstructed view of the underwater world that they offer. The Ocean Reef Aria is an excellent example in this as it has a lens that stretches across your entire face. 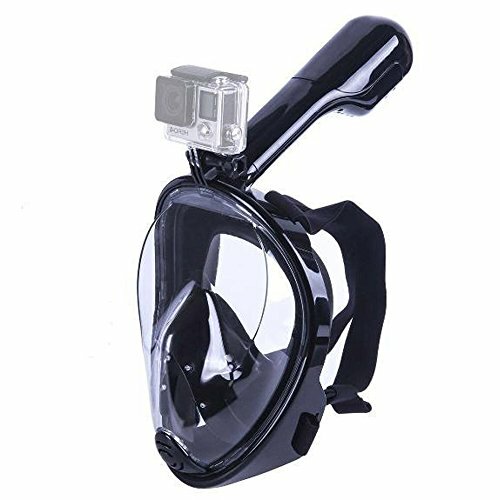 This provides you with a 180-degree view of every direction, which is exhilarating especially for first-time snorkelers. Thanks to a flat lens design at the front, the view in the Ocean Reef Aria is not distorted as it is in spherical lenses. A significant addition to the viewing experience is that the Ocean Reef Aria does not fog up thanks to a sophisticated airflow system. You will also not have to spit into the mask to clear up the fog before snorkeling. It is easy to snap the Ocean Reef Aria snorkel on and off making it easy to bring along on trips. A flutter system ensures that no water enters the snorkel and into the mask while snorkeling. It will also restrict your breathing the moment it closes off the snorkel to avoid entry of water. In rare cases where water gets into the mask, it’s easy to get rid of it. Just breathe out, and the water will run out of the mask through a valve at its bottom. You can view an exciting video of how the Ocean Reef Aria snorkeling mask is used and the how the snorkel is turned into a selfie-stick. Since Ocean Reef has experience in making full face scuba masks, they rarely go wrong, especially in design and comfort. This mask will fit perfectly on quite a variety of customer facial dimensions. Whatever the face size, the mask feels very comfortable on the face with soft edges and high-quality material. The great fit is one of the outstanding features of this mask and is praised in many reviews you can find. The most crucial aspect in a full face snorkeling mask is probably the efficiency of its airflow system. A mask that allows you to breathe naturally through the nose and mouth gives you a more relaxed time snorkeling especially if you are a first timer. Traditional masks and snorkels would have you put a snorkel in your mouth. If you rent the set, then you have no idea who used it before and now have to stick the mouthpiece into your mouth. On longer snorkeling trips it also tires the jaws and reduces the thrill of the memorable experience. Thanks to modern full-face snorkeling masks like the Ocean Reef Aria, your jaws do not have to experience any fatigue. The result is that you can snorkel for extended periods of time and have a richer experience of the underground world. The Ocean Reef Aria has a camera support mount that will allow you to mount a GoPro or any other similar sports camera at the top of the snorkel mask. You can also remove it and use the mount for better aiming during your filming. While the mount is not part of the mask, it is reasonably priced if you want to purchase this accessory. It also makes sense to get a float on your camera. It also teaches you how to connect other accessories like marker wings. Marker wings come in a wide range of colors and are useful in recognizing an individual’s snorkeler when his head is under the surface of the water. Although standard optical lenses are not included in the product package, the Ocean Reef Aria has a frame that allows the lenses to be mounted for snorkeling. Though lightweight, the optical lens support is also durable and easy to add and remove making the mask suitable for anyone. The optical lens support accessory is available for the S/M and L/XL sizes of the Aria. However, this is support only; you will have to buy a generic lens to fit or visit your optometrist to get lenses installed in your eyes. 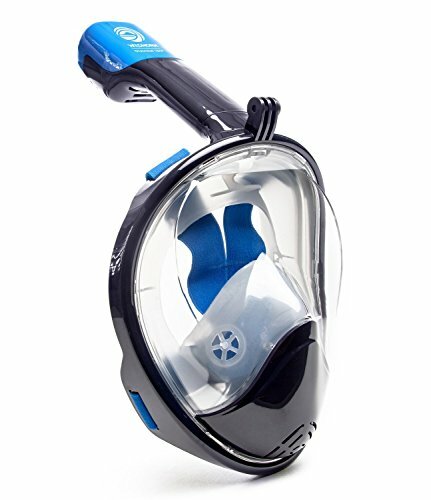 This full face mask is similar to the Ocean Reef Aria in most features including the 180-degree view, the camera mount, waterproof dry top, etc. It’s the original mask of this kind. It does not offer as many optional accessories but in turn is also priced lower. The design is also a little different from Aria’s with the water drainage valve located in a higher position along with other minor design tweaks. The material and most of the other features are comparable. Check out our review of the Easybreath to get more information! 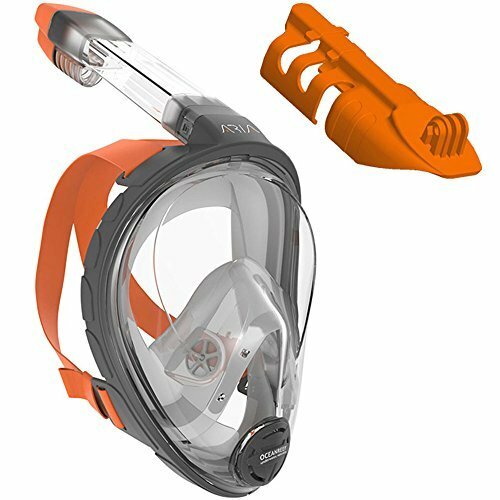 The Seaview 180 Full Face Snorkel Mask is just as Aria in visibility enabling the user to access 180 degrees of visibility. Most of the features are also similar with both having camera mounts and using shatter-proof poly-carbonate for the lens. The Seaview goggles have an action camera mount standard so you won’t have to purchase it as an optional accessory. They are also both available in multiple colors. The Seaview does not provide an option to mount prescription lenses. Otherwise, it’s probably a better choice as it’s typically lower in price. Click here to get an overview of all the features of the Wildhorn Outfitters Seaview 180 in our in-depth review! 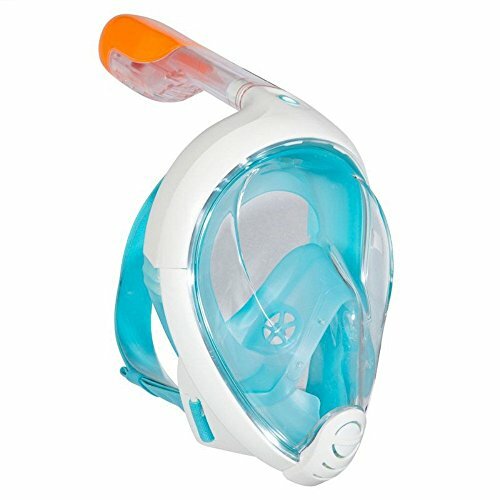 The X-Lounger snorkel mask is designed for adults and kids the age of seven years and above. It offers similar if not more features at a typically lower price compared to the Ocean Reef Aria. The snorkel on the mask can be folded for easy traveling and you also have a removable action camera mount included. A lot of the other features are similar. The quality of both masks is impeccable and you’ll enjoy snorkeling with either one of them. The Ocean Reef Aria Full Face snorkeling mask is one of the best of its kind. It stands out in how simple it makes snorkeling while improving the quality of the experience. If you are looking for a full face mask that doesn’t fog easy and supports a horde of accessories, then you found your perfect set of goggles. If you require prescription glasses, then it is the best mask you can get with the optional accessory to mount corrective lenses inside.